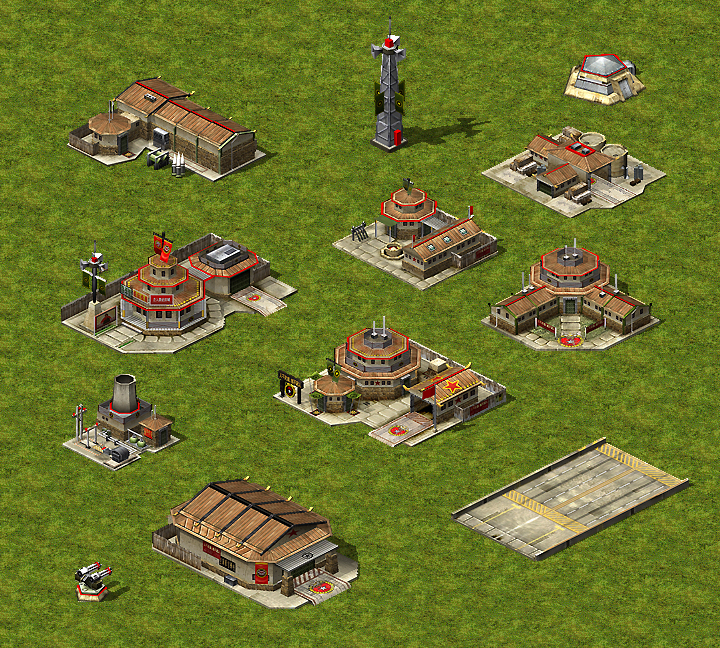 Here is a pack of Chinese buildings converted from C&C Generals for RA2. They include damage frames, buildups & alternative snow versions. There is also Gfx for the nuke missile so you can make a fully working superweapon. The War factory & Airfield had to be heavily modified to work in RA2 BTW. I'm not happy with them tho so I'll probably make new ones when I have time. I'm away for Xmas & new years but once I'm back I'll also convert the GLA & USA buildings from Generals too. PS: You can find cameos & a sidebar to go with these buildings on my site. These actually look amazing. Would it be possible to do C&C3 structures? ztype those are good. Ace work, I'm all for spotlighting these bad babies. I would presume so, once I'm done with the Generals buildings I'll look into it. 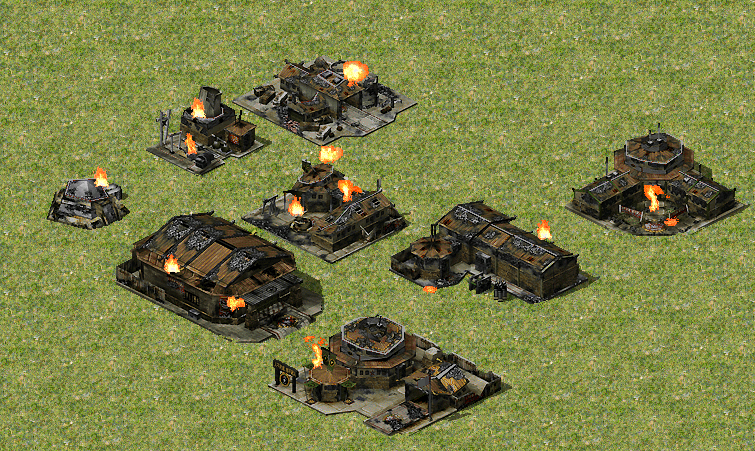 I wouldn't spotlight these just yet - unless Miggy has code that wasn't supplied, SHP Builder is showing some fuzziness on some of the animations (specifically, what I presume is the War Factory's buildup sequence). Otherwise, not bad for a first go. I vote spotlight after you've uploaded the whole set for GLA and USA. By fuzziness I presume you mean the slight colour variance between frames because I used the the diffusion dither when applying the pal. Now this could be my lack of experiance, or it could be the fact no tool of mine ever works properly, or my tool is outdated (i've been using the one from the old page links to YRAG) - but that to me looks like the SHP corrupted somewhere along the way. I get the same result with 90% of the SHP files on Selphir's Stuff - I've found it does present problems when sequencing, especially for Infantry SHP's. So far, I've only found this animation - the War Factory Build Up - to be doing this. and you dont need codes to spotlight something. Maybe, I'm not discounting the possiblity, nor do I mean to say these are terrible - they're not, and clearly Miggy worked on them. May I ask what program version your using to check them? I'm running SHP Builder 3.36. Load setting set to Supra Load (which apparently restores corrupted files) and Auto Detect Compression. Any closer? ues Os Shp Builder Offset Way for loading. You dont need to use Supra unless your trying to load a corrupted shp file. Oh, and great stuf Mig! Seems to have fixed it. I was wondering for ages why I was getting that issue. So thank you Cranium and my condolences and apologies to Mig Eater. Ah I see, well I'm sorry if I sounded a bit harsh too. Thanks for taking time to make public assets. Looking forward to C&C 3 structures. Perhaps you could write a tutorial on how to convert generals structures to something that fit RA2(in other words, how you did)? I would like to convert some buildings from Remix. Sweet Jesus. This is made of win and epic. I would like to convert some buildings from Remix. So you want me to show you how to rip assets from other mods... TBH they aren't that hard to convert, anyone with basic 3DS Max skills can do it. It just takes fecking ages tho, took me roughly 30 hours over 3 days to do this set. Oh. I will be putting it to use as a side project for sure. Does the Nuke silo has firing animations? The Propaganda Tower could be improved by the removal of the matte grey bits between the scaffolding. heywow lets take it easy fella. It is for personal use. My guess for the time consuming process is that you also converted many animations and the buildups. If these came from generals, any chance you can put the actual models up? Yep, everything you need to make a SW. I presume it's possible to do that with a mask or something, but ATM I'm unsure how. All you need to do is extract the W3D files from the game & then run a import script in 3DS Max. -nggatt_a.shp doesn't rotates even by 11.25° at each frame. Some frames it's faster and others it's slower, which will make it ingame face slightly aside on some directions. -some buildings move at the last buildup frame slightly to one direction, which looks strange. e.g. ngbarkmk moves at the last frame to northeast by about 1 pixel. ngbunkmk 1 pixel to southwest. -all the buildup anims could be much better. Instead of raising the whole building, you should have used a slice modifier in 3dsmax, where you move the slice plane upwards and let it only show the model below the plane. This way the plane moves like an invisible barrier upwards, revealing more and more of the building, which makes it look like it is really build up. Or split the building in several parts, which will the build up at different frames. Do you made the damage frames or did the model had them already? One request mig, one. Could you convert the militia tank (the t-54) to voxel? otherwise, totally epic set. Yours are inspired by GenZH. From what I see here, Miggy directly used GenZH's models. Spotlight! Nothing more to say. Though i would still like to see the issues fixed, which i've mentioned above. @Dutchy: I know, I only just stared using 3DS Max & I managed to do it, why hasn't anyone else bothered before now! I only had a few days to make this pack, otherwise I would have spent longer on the buildups. I feel they are ok for now tho, after all most buildings for d/l don't even come with buildups. I've noticed that atleast for me, just doing 32 frame 360° rotation animation causes that particular issue, where all turns are not 11.25°. Not an expert user of Max so haven't bothered to figure out why it does that so I'll just rotate it by 45° every 4 frames and it works fine. use 32 key frames,each 11.5o,and you will get a perfect rotation anim. I was converting Generals stuff last year, and actually have quite a bit of stuff rendered, just not in .shp form yet. I was making them for Aro and some reason just fell away from it. There are a couple of things for download from Generals that i posted already. For the turret thing. The easiest way to do it for me is, set your turret facing North, click autokey, scroll the animation time line to frame 32, rotate your turret 380* degrees, untick the autokey and you have your rotation frames. just remember to delete the last frame so you'll only have 32 frames. "Max frames start at 0"
Oh, and congrats on the spotlight. The easiest way to do it for me is, set your turret facing North, click autokey, scroll the animation time line to frame 32, rotate your turret 380* degrees, untick the autokey and you have your rotation frames. just remember to delete the last frame so you'll only have 32 frames. "Max frames start at 0"
and dont forget to switch keyframe's animation to be linear. otherwise angle betwin each rotation stage will be not equal. MAX sets smoth keyframes by default. and dont forget to switch keyframe's animation to be linear. otherwise angle betwin each rotation stage will be not equal. MAX sets smooth keyframes by default. 0-31 frames, and this ^. Default autokey anims accelerate in beginning/decelerate at the end. Just adding something to what gangster said. Max defaults the keyframe tangents to soft, so the animation accelerates at the start and deaccelerates at the end (which is quite nice for deploying animations). In the case of rotation, this would mean that it won't turn the same amount of degrees with each frame. You can set the tangents to linear to fix this. To do so just change the option in the button that's to the right of "set key". Alternatively, you can open the "mini curve editor" (to the left of the keyframes and time slider), select the keys that you want to turn linearly and set their tangents to linear. Though making it turn 11.25º manually is probably a better idea. Hah, terrain makes a big difference. They look so much better with Mig's grass in the background. Is there a Naval yard?